I’d marked the locations of what appeared to be the territorial ponds in good ol’ Garmin. We found somewhere to park near Avon Causeway in a lay by full of recycling skips and set off on foot. After half a mile or so, we crested a hill and descended towards some small ponds in a patch of rough ground called a nature reserve. The first pond had a well-trodden path around it. Straight away, I spotted a couple of Azure Damselflies (Coenagrion puella) and snapped away just to record their presence, though little else was obvious from our first vantage point. We picked our way cautiously around to the other side of the pond. 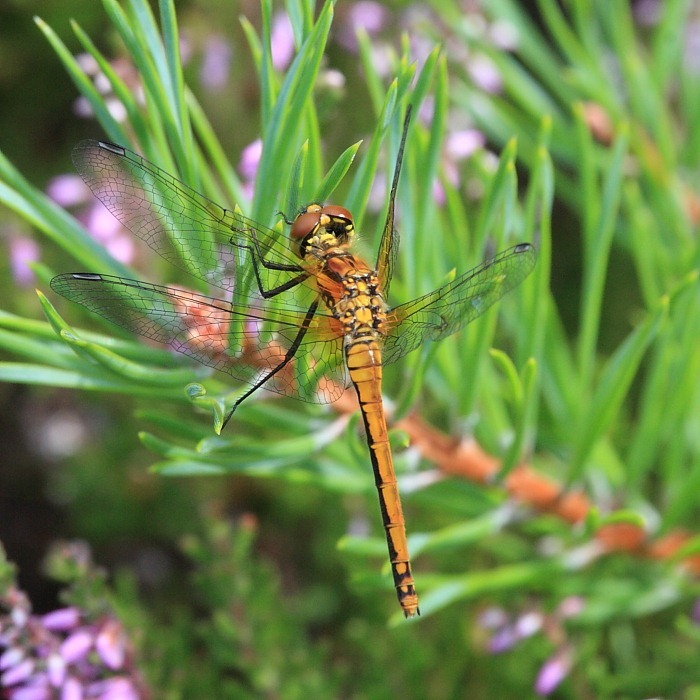 Eventually, there, difficult to spot in its low-visibility clothing and hovering around a bunch of heather growing in the margins of the lake, was what just had to be a Black Darter male. It was a mature specimen, almost entirely black, and couldn’t have been anything else. Shortly it settled. 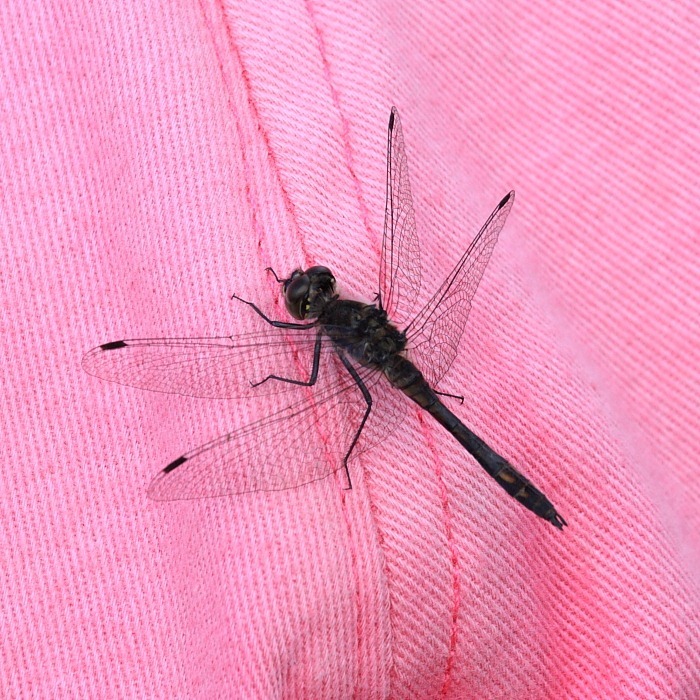 My first sight of this handsome creature, our smallest dragonfly (it says in the Smallshire and Swash book). 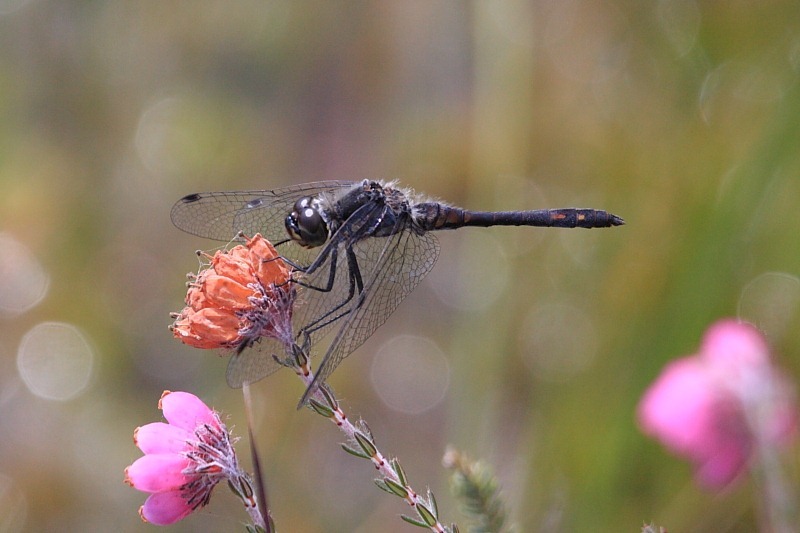 While I was mesmerized by my first Black Darter maintaining station over his territory, Francine had wandered off and made another intriguing discovery; she’d switched from carnivorous insects to carnivorous plants. 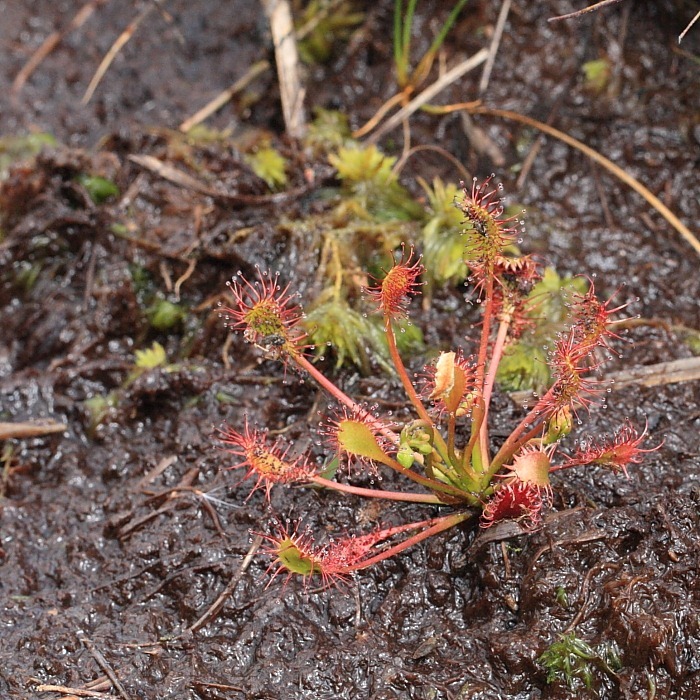 This whole area, including the Black Darter’s modestly sized little pond, was home to colonies of Sundew plants (Drosera intermedia – we think). Clearly the life of smaller insects here was somewhat tenuous; not only were the dragonflies trying to make a meal of them but so were the plants, with their glistening, sticky beads of liquid waiting to trap the unwary. Even Franco was fascinated seeing these plants in the wild. Eventually we managed to drag ourselves away and went in search of the second site, a lake in Ramsdown plantation. This lake turned out to be a fabulously rich habitat on the side of a hill – entirely captivating. Sure enough, it was crawling with Black Darters, amongst other more familiar delights. We both spent some time watching a Black Darter male flying sorties from the ground when it suddenly decided to make a perch of Francine’s fancy French pink casquette [cap]. I imagine it thought it was a large heather flower, being similarly coloured. It even remained sitting calmly as I removed the cap so Francine could see her passenger more closely. 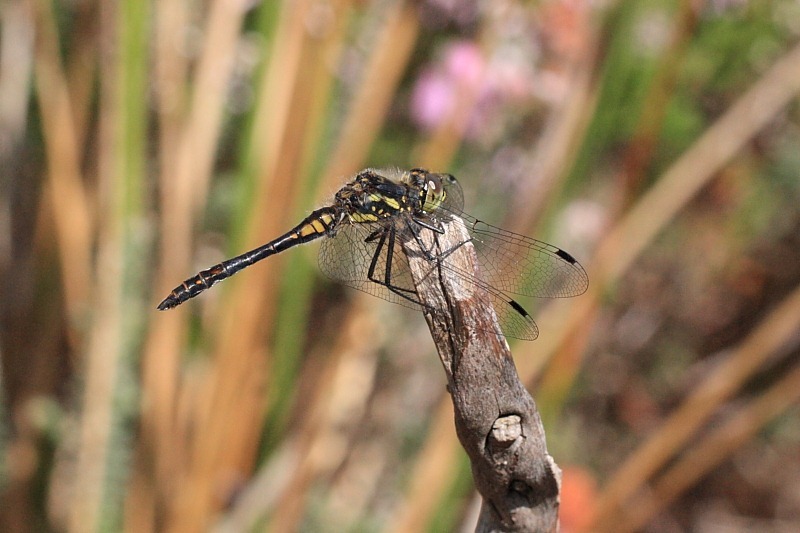 Immature male Black Darters are a little more colourful with varying degrees, depending on maturity, of yellowish markings. Francine nabbed an immature at one end of the lake while I was paddling in my wellies after other quarry. The path around the lake didn’t actually go all the way around the lake, we eventually discovered. On the opposite side we headed up the heather-covered hill in search of a way out without retracing our steps; there was none but it was a fortunate blind alley. Part way up, I scared up what turned out to be an elusive female Black Darter who flew just a short distance before posing for me, and very delightful she was, too. What an excellent day! Other than a missing in-cop pair, we’d pretty much grabbed a complete collection of representative Black Darter individuals to add to our growing collection.